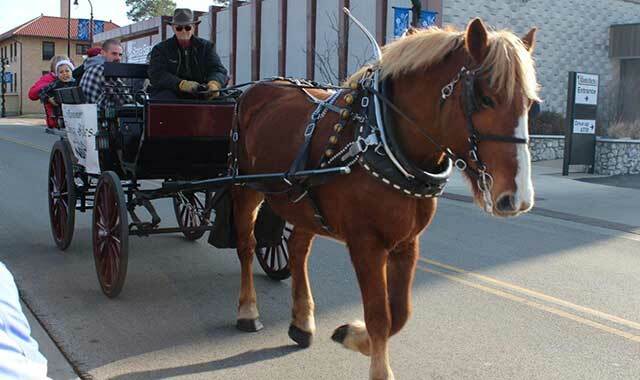 Hop aboard a horse-drawn carriage and see DeKalb County’s quaint communities in a new light this holiday season. DeKalb County is filled with a wide variety of festive decorations, beloved traditions and musical and theatrical entertainment during “the most wonderful time of the year” in this region. Through the end of the year, communities around DeKalb County are taking advantage of this magical time and sparking much imagination and wonder. Looking for something new and different to share with Santa? Enjoy a ride on Pete’s Train as it passes more than 300,000 lights and holiday figures around Lions Community Park in downtown Waterman. This holiday light train is the biggest and most popular event of the year in this small town, and you can catch a ride from Dec. 1 through Christmas Eve. The park is filled with giant toy soldiers, candy canes, cascading snowflakes, flying reindeer, swans-a-swimming and much more. Snuggle up and enjoy free hot chocolate and popcorn for a most memorable visit. Mark your calendars now for next year’s embarkations of Pete’s Train. Rides are scheduled for spring with the Easter Bunny and during the fall for a special haunted house and Pumpkin Train. Have you ever visited the historic Egyptian Theatre in downtown DeKalb? It’s lived a storied life since its 1929 debut and nearly crumbled away before it was lovingly restored in the early 1980s. Now on the National Register of Historic Places, the Egyptian is the place to be on many weekends. Besides the must-see astonishing architecture, stained glass window and two huge pharaohs, this destination sports a wide range of music and arts events. Live music fills the stage during the holidays with Home Free-Country Christmas Live on Dec. 8. This five-man band, known for its showstopping a capella performances, came on the scene when it won television’s “The Sing-Off.” One week later, join the Buckinghams on Dec. 16, as these Chicago natives present holiday favorites with brass-infused rock. Ditch the small screen and watch the beloved holiday movie “It’s a Wonderful Life” on the Egyptian Theatre’s huge 35-foot-wide by 22-foot-tall movie screen on Dec. 10. Holiday shopping throughout DeKalb County provides the surprise of unique stores and boutiques stacked with tempting finds, crafts, clothing and special treats. In DeKalb you’ll find a vintage mix of gifts and decor at Cracker Jax and Poppy Seed Primitives. The Confectionary offers handmade chocolates and other candies to satisfy that sweet tooth. For handmade gifts, take a trip to Belle & Herbie’s in the town of Cortland, located just east of DeKalb. Head south to Hinckley, where the quaint Happy Hen House changes with the seasons and is filled with home decor and unusual gifts, and Mandy’s Just Because features a “man cave area” with sports items and gifts. Antiques enthusiasts can find treasures at a number of specialty shops in Sandwich, in the southern part of DeKalb County. Once the holidays have passed and it’s time for the cold winter to settle in, seize the opportunity to try out night ice fishing at Shabonna Lake State Park, near the village of Shabbona. For more information on these events and a wide range of activities in DeKalb County, visit dekalbcountycvb.com. The Edgewater, in Madison, Wis., goes all out to celebrate the holiday season. Whether you’re planning for the holidays as a couple or a family, The Edgewater can accommodate. Located in downtown Madison, Wis., on the shores of Lake Mendota, this historic hotel has plenty of attractions this season. 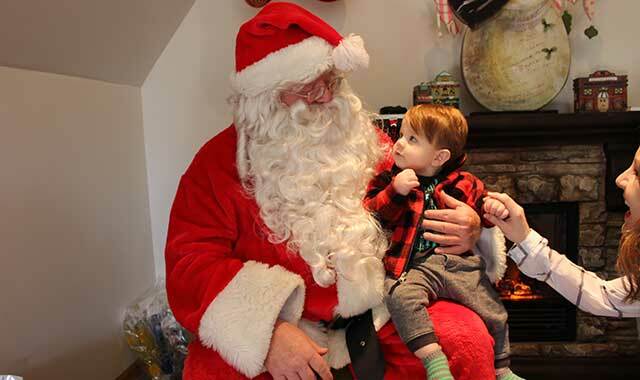 Among the most popular events this season is Breakfast With Santa. Families can enjoy “PJs and Pancakes” with the jolly old elf on Dec. 2. And if one big guy in red isn’t enough, Bucky Badger will join Santa for breakfast on Dec. 9. These packages include overnight accommodations, early admittance to get a photo with Santa, milk and cookies, and a “Night Before Christmas” book. Other special events include the festive “Holiday Tea at The Statehouse” on Dec. 16 and a Christmas Day Brunch. All this takes place in the Grand Ballroom, where 16-foot windows offer a beautiful view of the icy lake. But The Edgewater’s holiday spirit is not reserved only for special weekend events. The exterior shines brightly with holiday lights throughout the season, surrounding the Outdoor Grand Plaza. It’s turned into an outdoor ice rink where you can skate with the Wisconsin State Capitol Dome in the background. And towering over the rink will be three huge Christmas trees. It’s almost like you’re in New York City’s Rockefeller Center. Throughout the festive season, The Edgewater’s full-service spa offers holiday-related treatments. The December special is called the “Peppermint Bark Bliss Pedicure.” Toes are dipped into a warm bubbling bath of candy cane champagne. After a moisturizing sweet cream-scented sea salt scrub, a luxurious layer of chocolate – full of vitamins and enzymes – is applied to pamper and protect the feet. A relaxing rubdown of sweet-cream body milk concludes the treatment. When The Edgewater is finished celebrating Christmas, it turns its sights on New Year’s Eve. And there’s no shortage of things to do. First there’s the New Year’s Dinner in The Statehouse on Dec. 31. It includes overnight accommodations, a bottle of sparkling wine and dinner for two. Then stick around for the New Year’s Eve Ball Drop outside in the Grand Plaza, featuring a midnight countdown. It’s free and open to the public. The Edgewater also offers its Destination New Year’s Eve Package, which includes overnight accommodations, a bottle of sparkling wine and two tickets to a New Year’s Eve Party in the Grand Ballroom. It includes an open bar with beer, wine and champagne; light appetizers; live music and a midnight breakfast. The Edgewater has been a prominent part of downtown Madison for nearly 70 years and has hosted a vast variety of celebrities including Elvis Presley, Elton John, Bob Hope and the Dalai Lama. The privately owned facility went through an extensive $100 million renovation in 2014 with a focus of continuing to be a year-round, community-focused hub of activity. For more information, visit theedgewater.com. 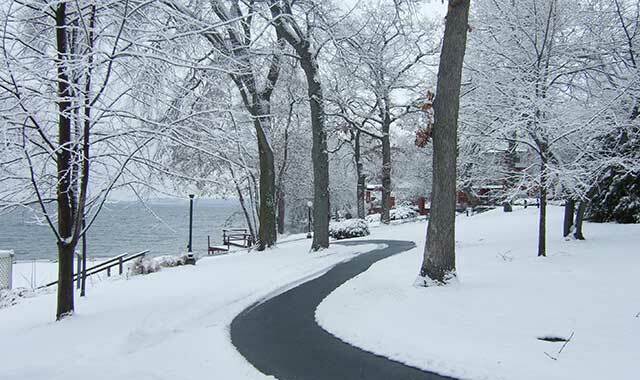 Head up to Green Lake, Wis., for a true winter getaway. Winter events in Green Lake, Wis., dare you to do something new. Days and evenings come alive during the snowy season with invitations to embrace sledding, cross-country skiing, ice skating, snowmobiling and ice fishing. But that’s just the start. A Green Lake experience is exciting year-round, yet winter enthusiasts have been traveling north to this quaint and vibrant community for the past 150 years. Locals hail it as the oldest resort community west of Niagara Falls, with a shoreline of more than 20 miles as its main attraction. The Heidel House Resort & Spa has been a winter escape location for more than 60 years. It’s been a favorite lakeside destination, in part, because it offers a retreat where guests participate in and learn new and familiar recreational activities. With groomed trails and a picturesque frozen lakeshore, Heidel House caters to many winter adventurers. There’s no need to be an expert ice angler. Equipment and knowledge are provided as fishing guides from local Mike Norton’s Fishing and Hunting pave the way for a successful day on the ice. The group is shuttled to a top fishing location on Big Green Lake, Wisconsin’s deepest inland lake. The day begins with a hearty breakfast in the resort’s Sunroom restaurant and ends with a relaxing experience in the resort’s award-winning Evensong Spa. Take home your catch after the Norton’s team cleans and packages it for you. The usual winter favorites abound throughout the Green Lake region. Depending on snow conditions, visitors can enjoy snowshoeing on local trails, sledding at Zobel Park or cross-country skiing at Green Lake’s Sunnyside Conservancy, a protected natural area that’s home to lakeside ski trails. There’s a longer trail at the Red Pine Ski Trails of Mecan River Outfitters, with 15 miles of groomed and tracked trails passing through red pines, hardwoods and marshland. The trails are perfect for all levels of skiers, from the experienced to the novice. Ever heard of fat tire biking? It’s an entirely new winter experience. Fat tire bikes are just what they sound like – bicycles equipped with oversized tires that are capable of cruising through the snow. Rent them hourly at either Heidel House or Green Lake Conference Center. A visit to town is sure to yield original treats such as handmade gourmet chocolates from Guth’s, which was established in 1921. Dish Green Lake is a new Parisian-inspired boutique. Gysber’s Jewelry is a time-tested jewelry store that has built a legacy through four generations since its founding in 1874. “Green Lake prides itself as a destination to enjoy the good life for recreation, relaxation and the arts,” says Alyssa Paulsen, marketing and project coordinator for Green Lake Chamber of Commerce. For more information see visitgreenlake.com. There are many ways to enjoy the holiday season. Whether you prefer religious or traditional occasions, the Rockford area has something for the family to enjoy this season. The kickoff to the winter season is the fourth annual Stroll on State, which takes place on Nov. 25 in downtown Rockford. 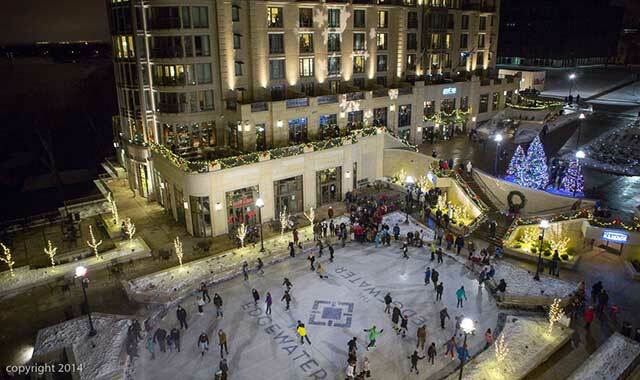 While you’re exploring downtown, you can see Santa, go ice skating and check out the many festive decorations. The day is capped by the lighting of the official city Christmas tree. One of the city’s longest-running traditions is the Festival of Lights, which runs 5-10 p.m. every Friday, Saturday and Sunday in December, including all night on Christmas Eve. The winding road through Sinnissippi Park comes to life with 50 holiday-themed lighted displays. One of the newer traditions is “A Night In Bethlehem,” a drive-through live nativity put on by Riverside Community Church in neighboring Machesney Park. Upon entering the event, visitors receive a CD to play in the car that tells the story of Jesus’ birth. As they drive through the church campus, visitors pass scenes that feature people in costume along with live animals including goats, donkeys and camels. The event is free and runs 6-9 p.m. on Dec. 9 and 10. If it’s holiday music you crave, check out J.R. Sullivan’s Hometown Holiday at the Nordlof Center on Dec. 8, 9 and 10. It’s a seasonal variety show featuring storytelling, comedy and music performed by local talent. Then, on Dec. 16 at the Coronado Performing Arts Center downtown, the nationally acclaimed group Five by Design joins the Rockford Symphony Orchestra for seasonal music ranging from classics to original songs. For continuous fun throughout the winter, families enjoy Snow Park at Alpine Hills, a 5-acre ski and snowboarding park that includes separate tubing and terrain park sections for all skill levels. Located just 10 minutes from downtown Rockford, this hotspot in the cold has on-site snowmaking equipment to keep the tubers, skiers and snowboarders going when Mother Nature doesn’t cooperate. Tinker Swiss Cottage Museum: From Nov. 21 to Jan. 14, Tinker Swiss will have a “Cottage Christmas,” where visitors can see Tinker-original decorations while learning about Christmas traditions in the Victorian era. Nicholas Conservatory: Nov. 26-Jan. 8: The beautiful conservatory and gardens area will be lit up in full holiday splendor, along with colorful floral displays in its annual All Aglow theme. Ethnic Heritage Museum/Graham-Ginestra House: Sundays from Nov. 19-Dec. 17, the Ethnic Heritage Museum offers six galleries focusing on various ethnic Christmas traditions, including African-American, Irish, Italian, Hispanic, Lithuanian and Polish. Graham-Ginestra House will have a theme of English Holiday Tradition. Klehm Arboretum: There’s plenty of holiday music and food as Klehm holds its Christmas Concert and Holiday Dessert Buffet on Dec. 3. Local musicians and singers entertain while patrons feast on a buffet of desserts, candies and treats. Midway Village Museum: On Dec. 9 and 10, several of the museum’s buildings will be adorned in 1800s decorations for its Victorian Holiday Celebration. The event includes dancing, stories, crafts and horse-drawn wagon sleigh rides. Discovery Center Museum: From Dec. 26-30, the Discovery Center goes into post-holiday mode, with hands-on arts and crafts activities that include science, math and engineering. On Dec. 31, families can enjoy fun activities while counting down to midnight around the world. Burpee Museum: On Dec. 31, celebrate New Year Around the World with displays of authentic items from other cultures, folk dance performances from various countries, and an hourly countdown to 2018. To learn more about the Rockford area’s holiday schedule or to plan your trip, visit gorockford.com. Starved Rock Lodge is beautifully decorated for the holiday season, a perfect time of year to book a mid-week getaway in the woods. If you want to get in the holiday spirit, a trip to Starved Rock Lodge & State Park, in Oglesby, could be the perfect place to go. The historic Lodge is nestled among tall oaks and snow-covered pines, and it’s conveniently located less than two hours from most Chicagoland locations. Within the park, deep sandstone canyons, towering bluffs and seasonal ice falls are the “must-see” destinations during the winter months. The Lodge is beautifully decorated for the holiday season and its massive, two-sided fireplace warms the chilly air and welcomes guests from near and far. Hikers love to explore the change of scenery where freshly fallen snow covers canyons to create a winter wonderland. Some visitors hike on their own, while others prefer the added experience of a guided hike to LaSalle Canyon, available every weekend throughout the year. Holiday events at the Lodge include Breakfast with Santa on Dec. 16 and Christmas Lights Tours from Dec. 16-23. On Dec. 20, a paint and wine class will be offered in the cafe and a special tour invites guests who have never been to the Lodge to join a brief talk and tour. Book an overnight stay and join the Lodge’s annual New Year’s Eve Party, ringing in 2018 with a Nashville Nights party in the Great Hall. If a wedding is in your future, the Lodge’s annual Bridal Expo is on Jan. 7 from noon to 3 p.m. Starved Rock has become a destination for outdoor weddings in warm weather. Indoor ceremonies and receptions are hosted in the historic Great Hall, and outdoor sites are available, too. Brides and grooms-to-be can sample food for their cocktail hour and reception. Preferred vendors are there to make it much easier to plan a dream wedding. Dog Sled Demos, hosted by Free Spirit Siberian Rescue, returns to the Lodge on Jan. 14 and Feb. 18. Outside along the riverfront, dog sled teams will demonstrate how their sleds run in an Iditarod or similar race. Event Coordinator Jason Hussong will also present educational seminars in the Lodge’s Utica Room. Adventure seekers are encouraged to sign up for the MegaHike on Jan. 20-21 and travel to each of Starved Rock’s canyons in one day. Eagle Trolley Tours are offered in January and February on Mondays and Wednesdays at 11 a.m., Saturdays at 9 a.m. and 11 a.m., and Sundays at 10:30 a.m. Tours include lunch and a guided tour aboard a Starved Rock Trolley. This is the most popular winter tour. Eagle Watch Weekend, set for Jan. 27-28, brings free “Birds of Prey” shows and hands-on exhibits to the Great Hall. In the quiet of winter, hotel rooms and cozy cabins set peacefully in the surrounding woods provide a getaway that can be truly restful and rejuvenating. Best of all, an indoor pool complex is just a few steps away with a pool, hot tub and two saunas. Massage therapists are available, by appointment, for a hot stone, aromatherapy or deep-tissue massage inside a dedicated cabin located on the property. 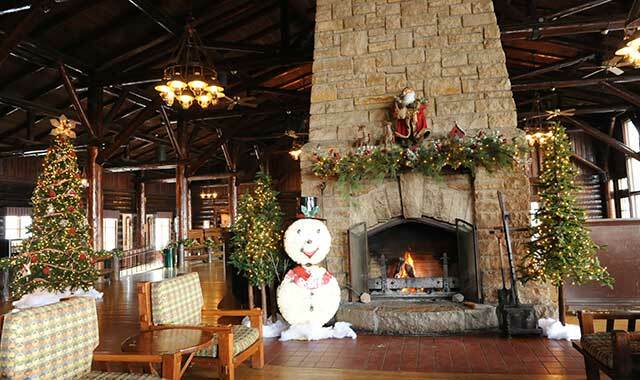 To learn more about all of Starved Rock Lodge’s winter events, visit starvedrocklodge.com. Sycamore welcomes the holiday season with fanfare, as it celebrates with events like the Winter Chocolate Walk, living window displays, and visits to the Santa House, where children can share their wish list. 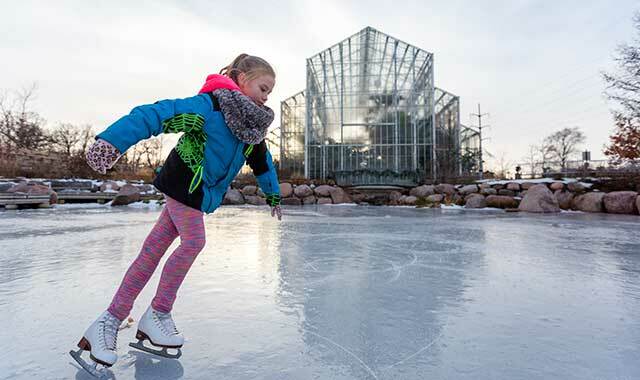 Located 60 miles west of Chicago, the city of Sycamore offers a variety of activities year-round and winter is no exception. Though the weather might be frigid and the sky a bit gray and dreary, visitors to Sycamore can still find plenty of things to do during the winter months to help brighten up their spirits. For starters, the season kicks off with the Sycamore Winter Chocolate Walk, which takes place on Thursday, Nov. 30, from 4 to 8 p.m. Select shops offer treats that make the hearts of many a chocolate-lover skip beats. Indulge your tastebuds with chocolate bars, pretzels, chocolate martinis, chocolate cookies and more chocolate concoctions. Interested attendees can purchase tickets at the Sycamore Chamber of Commerce office and Eventbrite.com. On the day of the walk, maps and check-off cards will be provided at the starting point, located at Blumen Gardens on Edward Street. Visitors to Sycamore in December can get into the holiday spirit at the city’s Festival of Trees, which takes place Dec. 1 through Dec. 31 at the Midwest Museum of Natural History. Those who visit this festival can enjoy special weekly events, create make-and-take crafts on select days and vote in the annual tree-decorating competition, where more than 20 trees decorated by local businesses and nonprofit groups compete for awards. Vote for your favorite tree by making a donation to jars found in the lobby. As an added bonus, free hot chocolate is provided on Saturdays with paid admission. Additionally during the month of December, people can pop by Santa’s “vacation” home on the courthouse lawn and say “hi.” Rumor has it he’s in during select hours on Fridays, Saturdays and Sundays. He also has a personal mailbox attached to his house for those who feel like dropping off wish lists. When it’s too cold to enjoy much outside, visitors can still take advantage of Sycamore’s plentiful eateries and shopping venues. Throughout the season, explore Sycamore’s variety of shops. Snag something unique and new at Sweet Earth Jewelry, Whimsical Perspective or Sycamore Antiques. Warm up with some spirits at Prairie on State Wine Cellars. Enjoy a romantic dinner at Nat’s On Maple or Ristorante de Acquaviva. If you’re longing for spring, get an early start planning your garden at Blumen Gardens, which is open this season Tuesdays through Sundays from 10 a.m. to 4 p.m. Peruse birdseed, birdhouses and heated bird baths, greenery for your house, Valentine’s Day gifts and more. Check the calendar for special events and potential classes that may help you to create projects such as mini-gardens and floral arrangements. For more information, visit blumengardens.com. To learn more about Sycamore attractions and upcoming events, call (815) 895-3456 or visit discoversycamore.com. This entry was posted on Friday, November 3rd, 2017 at 11:58 am	and is filed under Recreation & Destinations. You can follow any responses to this entry through the RSS 2.0 feed. Both comments and pings are currently closed.